In this episode, Dan Lok explains how to become a high ticket closer even if you have never experienced how to sell a high ticket offer before. He is going to walk us through his entire journey from immigrating to Canada, to starting his own business, and becoming the highest paid consultant in the high ticket closing niche. I think we all have a lot to learn from this interview, including the exercise that will help you make some crucial decisions about how you can move forward in your business or career in a bigger way. Listen through to the end of the episode, download this special PDF, and make sure you share this article with other entrepreneurs that want to learn how to become high ticket closers. There is no relationship between you being good at what you do and getting highly paid – Dan Lok. 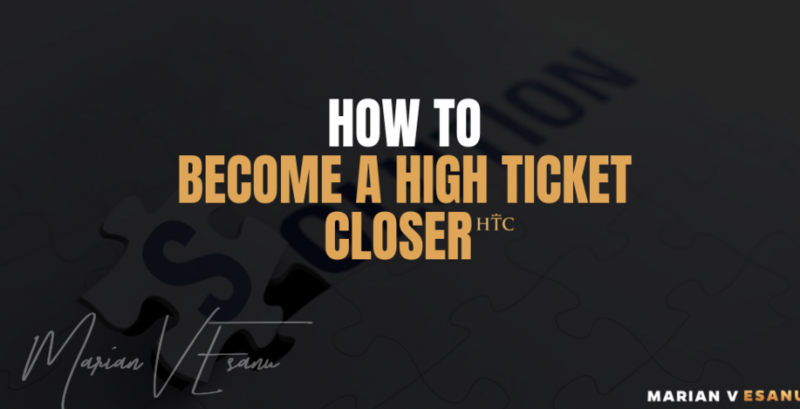 Becoming a high ticket closer is no easy task. It takes years of hard work and strategizing to make happen. In this interview, Dan Lock, who is an International Best-Selling Author and one of the highest paid consultants worldwide shares the high ticket secrets with us. We talk about his journey as a an immigrant who arrived in Canada when he was 14 and how he has went from zero to becoming one of the highest paid consultant all over the world. So, if you’re someone who is looking to go from zero to a sought after, high ticket closer, then Dan Lock is someone you will want to listen to. Answer: It was hell! When we first moved here we were in a one bedroom condo and I would sleep on a bed in the middle of the living room floor. On top of that, I was one of three chinese people in my high school and I got bullied and beat up every single week. Being born in Hong Kong and immigrated to Canada at 14, Dan’s parents got divorced shortly after. So, his mom raised him for the most part. They made fun of my accent and my weight and I had no friends. I would sit at the back of the classroom and I would never put up my hand. I was afraid to say anything. You could have been in the class with me for the whole semester and never know my name. Question: What made you push forward in your journey to become a high ticket closer? Answer: The concept of a high ticket offer was unknown to me back then. I didn’t know what I wanted, and at 17 years old my dad went bankrupt. He had been sending money to me and my mom every month and I remember coming home one day and I heard my mom and dad on the phone. I realized she was crying. I always remember the look on her face. It was a look of hopelessness. That’s when my dad told her that he couldn’t send us money anymore. We were on our own. At that point, I said to myself “I never want to see that face again. I will do whatever it takes so she doesn’t have to worry ever again.” In my teenage years, I was working. All my friends were drinking and chasing girls, and I was working. In college, I always had something on the side. For five years, I didn’t take a single day off. I never watched a single sports game, and honestly, I still don’t to this day. So for the first five years in my business, I did what most people won’t do and now I have what a lot of people won’t have. Question: How can someone brake the 9 to 5? Answer: Communication equals wealth. So if you want to to be wealthy in an English speaking country, you need to learn the language. So, for me, at the time, I would write in a dictionary every day and I made a point of learning one new word every day. I would also have an audio version so I could hear how the words were pronounced and repeat them back. Don’t let it hold you back, but you have to commit to learning the language so you can communicate and do business. Answer: Find a side hustle, but not just to make money. I worked for my mentor for the first year basically as a volunteer. However, I call it my million dollar year because I learned the skills that gave me the foundation to get to the income I’m at today. If you think about a martial arts master, how do they pass these skills on to someone else? It’s a one on one, behind closed doors practice. Question: If someone is a freelancer, how they can become a high ticket closer or a highly paid consultant? Answer: There is absolutely no relationship between being good at what you do and getting paid. I don’t care how good you are. It’s about being able to close. You have to learn how to communicate your value. Let’s say you’re charging $2,000 per project. And you charge that for a while. But now your closing skills are better. You can now charge $4,000 per project, which means you’re now you’re charging twice the amount for the same work. Your skills, your services have not changed, your closing skills changed. But what if you could charge $6,000 or $10,000? You can always find people who know more than you but you’ll be able to close more and charge more. It’s not about your offer, it’s about your closing skills that command premium prices. The closing is what improves your skills because the more you close, the more experience you get, and the better your skills get. Question: How does someone develop their high ticket offer closing skills? Answer: I teach a program called the high ticket closer program. It takes people from not knowing anything about sales to being able to close. I would say it takes several weeks to learn. And, it’s about the way you ask questions. When you’re selling low ticket stuff, the traditional selling does work. When you’re selling something high ticket, the last thing you want to do is sound like a salesperson. They want to buy, but they don’t want to be sold. Clients want to feel like they’re making the decision on their own and they need to see the value of the exchange. Answer: I subscribe to the principle of the fact that you can’t get rich by looking poor. Now people will say well what about someone like Steve Jobs? Well, when you’re a billionaire you can dress however you want, but until you get there, you have to dress the part. You never get a second chance to make a first impression. So when you look good, you feel good, and you perform better. You need to line up your brand with your high ticket sales. Forget about what everyone else says. You are your personal brand whether you want to be or not. You are people’s impression of you. So why not be strategic and be in charge of how you want the world to perceive you. Many years ago I was attending a two day conference. The first day the speaker stood up and talked about adding and increasing the emails on your list. I called my web guy and had him implement the strategy as soon as I got back to my hotel room. It doubled my subscriber rate overnight. The next day, the speaker found out about the results I got from his tip and this is what happened. In the audience there were 500 people, and when they were asked what results they had achieved, no one had even implemented the strategy yet. I thought everyone would do what I did. I thought everyone was like me. No one was doing what I was doing. My competitive advantage is my speed. It’s the fast fish that beats the big fish. It’s about how fast you can learn and implement. Don’t be impressed by the people who try to teach you how to get from zero to one million in a few months. Look at the people who are succeeding long-term. Do what they’re doing. Speed, money, love, speed. It’s the same scenario with high ticket offers. You can’ expect someone to teach you how to become a high ticket closer, if they have never sold a high ticket offer ever before. The problem is that all these “formulas” are trying to come up with something people have never done. That’s when you go against entrepreneurship and you fail. You don’t need a step-by-step process, you don’t need a blueprint. You need to experiment with what you learn. What worked for one person may not work for you. Separate yourself from everyone else by accumulating advice and strategies but then turning them into something that works for you. That’s true entrepreneurship at its core.